The photograph is of Samuel Clarke(1815-1888) with a Plesiosaur skull. He collected and sold fossils in the mid 19th century. He married Susan Diment in 1848. His sister was Sarah Clarke who married Edward Gollop in 1836. In 1861, 1871 1nd 1881 Census he lived on the Old Lyme Road near the Gordges and Gollops. The 1891 Census shows him as a Dealer in Fossils at no.2 Knapp Cottage at the junction of Higher Sea Lane. This is where Isaac Hunter lived before moving to Victoria Cottage in Higher Sea Lane. 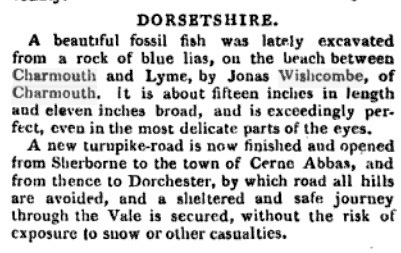 In 1864 Day purchased "one of the most perfect Plesiosauri ever found on the Dorsetshire coast" for £40 from the local dealer Samuel Clark of Charmouth shown here on the left. He was also assisted by a young Isaac Hunter, on the right in locating suitable examples for his collection. The illustration shown above is from Owen`s “A monograph of the fossil Reptilia of the Liassic formations” published in 1863. The most remarkable feature of this discovery was that in 1864 Day sold it on to the British Museum for £200, a fortune at the time. The Plesiosaurus can still be seen in a showcase on the wall of the Natural History Museum in London and is illustrated here. Day was highly active as a geologist while he was at Charmouth. He helped Huxley with his researches on belemnites. In 1865 he revealed the true situation of the cephalic spines in the fossil shark Hybodus anningae and in 1867 he acquired from Isaac Hunterof Charmouth, a second new species of Plesiosaurus, which Richard Owen was to have called Plesiosaurus laticeps. Day left Charmouth for America in 1867and was Assay Master in the Columbia College School of Mining. He then became in 1872, Professor of Natural Sciences at the Normal College, New York, where he was also active as a botanist. 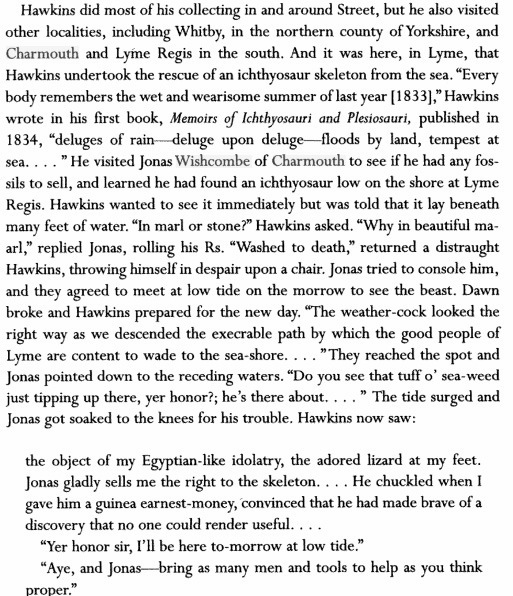 He died on 4 January 1895 in Algiers, whilst on tour in an attempt to recover his health.